An early-stage company in San Diego is betting on sorghum stalks — an agricultural waste product — as a healthier, greener alternative to formaldehyde-based particle boards that are widely used in office furniture and construction. Michael Hurst, who founded ChloroFill, has a bioengineering background and worked for leading life science companies before striking out on his own. When he learned that particle board made with formaldehyde will release gases for six to 10 years — which could cause cancer — he decided he wanted to make green office furniture. 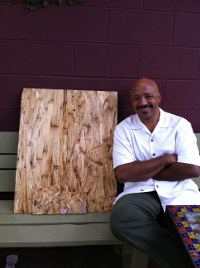 When he came face to face with the realities of making furniture, he began to focus on making green fiber board panels. Four years ago, he learned about Beijing Forestry University and collaborated with them to fabricate the board, testing different crops before zoning in on sorghum. “My plan was a little backward. Instead of outsourcing manufacturing to China, I outsourced R&D there with the idea of bringing back green jobs to the U.S.,” Hurst said. There are thousands of varieties of sorghum, but the main type is a cereal grain grown in warm climates for food, fodder and biofuel. Sorghum is a renewable resource, growing more than 6-feet-high in a year. The stem is naturally resistant to many fungi and insects, so sorghum is grown with less pesticides and chemical fertilizers. Once the grain head is cut off, the leftover stalk is used for thatch, fences, baskets, brushes, paper and brooms. But because there’s an overabundance of waste stalks and not as much demand for it, it is often burned in many parts of Asia and sometimes in the United States, which leads to air pollution. The United States is currently the second largest producer of grain sorghum and the largest exporter. Nigeria is the top producer, and India is in third place, according to the U.S. Grains Council. Hurst saw an opportunity to tap a waste product to make green fiber board, which could give furniture manufacturers an eco-friendly alternative and construction companies a chance to earn more LEED (Leadership in Energy and Environmental Design) brownie points. Reducing pollution and offering additional revenue to sorghum farmers was a bonus. In Hurst’s favor are rising concerns about the use of formaldehyde. The chemical is commonly used to bind particle board and composite wood products, but it is an indoor air quality hazard that has been linked to respiratory illness, asthma and premature death, especially among children and the elderly. Exposure to it can also increase sensitivity to other chemicals. Hurst said U.S. building codes are beginning to restrict formaldehyde use in buildings and furnishings, and the California Air Resource Board has mandated a 66 percent reduction in formaldehyde emissions from composite wood products by next year. ChloroFill’s sorghum-based products will use a resin binder in place of formaldehyde. “Sorghum’s tensile strength and relatively lighter weight make it ideal for furniture. It’s very tough,” Hurst said. He spent months in China and India, studying the supply situation and the long-term opportunity to source material there. Hurst and his startup also had help from Connect, San Diego’s business accelerator. He graduated from the Connect Spring Board program this year, after being mentored for more than a year. “Connect helped refine my marketing and business plan, sort of a sanity check, got me ready to pitch investors,” Hurst said. It also put him in touch with a former CEO of an Irish green panel manufacturer, Lou Hess, who is now his industry adviser guiding the company on product placement and market segmentation. “We were fortunate to find him, like finding a needle in a haystack,” Hurst said. The company now has a pilot base in San Diego to develop its oriented strand board panel. It is working with two agricultural companies in the Midwest to develop a hybrid variety of sorghum suitable for its uses. For now, it is focused on two key products: the oriented strand board panel, which will be launched this year and can be used for interiors, furniture and construction; and a structured insulated panel, which is in the pipeline, typically used in modular buildings. Hurst explained that in colder climates in Europe and parts of the United States, the structured insulated panel is often used to build rapidly, replacing the typical Styrofoam, because the insulation is twice as high and the price is comparable. The builder benefits with speed in construction, and the homeowner enjoys a reduced energy bill. ChloroFill is not the first company to pioneer the use of sorghum in fiber board panels. Another company, based in Solana Beach, is already in the market with sorghum panels. Kirei USA makes 3-by-6 panels for interiors, whereas Hurst says his company will make 4-by-8 panels suitable for U.S. construction. And he said his panels will be made in the United States and be competitively priced. “This is a unique time in our history. It’s going to be cheaper to make them in the U.S., and we’ll save on shipping and the carbon footprint,” said Hurst, who learned about his competitor when he was halfway through his research for a new board. He is evaluating manufacturing bases in San Diego and Imperial County — which has sorghum crops plus a 30 percent unemployment rate — and is wooing firms like his to the area. So far Hurst has managed with his own funds, but he said that establishing a manufacturing unit will require a capital investment, so he is looking for investors. Hurst will target specific markets, such as interior designers who will be brought up to speed about ChloroFill’s aesthetic appeal for table tops, counter tops, walls and ceilings. He will also sell to suppliers such as Gensler, a global design company, and large builders. The local builders did like his board, he said. “We’re not as cheap as particle board, but we are comparable to pine- based (oriented strand board) and bamboo plywood,” Hurst said. Hurst has big plans for his startup. In the future, he not only wants to source and manufacture in Asia, but he also wants to sell his products in India and China. Ruprecht von Buttlar, who mentored Hurst at Connect, said Hurst has been able to position his board as a superior, sustainable alternative, and he expects the company to be a big success once the economy improves. Hurst, who just launched his company, thinks this is a good time to do so, as builders who have survived the downturn want to set themselves apart, and green materials present a huge growth opportunity.